Geographical setting: The prehistoric flint mining district of Rijckholt (also spelled Ryckholt)-St. Geertruid lies approx. 6 kilometres SSW of Maastricht in Southern Dutch Limburg. 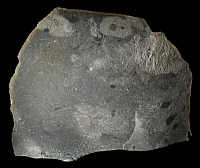 It is located on the first high ground, formed by a ridge of Upper Cretaceous (Maastrichtian) chalk, on the Eastern side of the valley of the river Meuse. In this ridge several members of the Gulpen Formation (for a lithostratigraphical scheme of the region, see the introduction to the ENCI quarry) come very near the surface, only covered by some Pleistocene terrace gravels and loams. 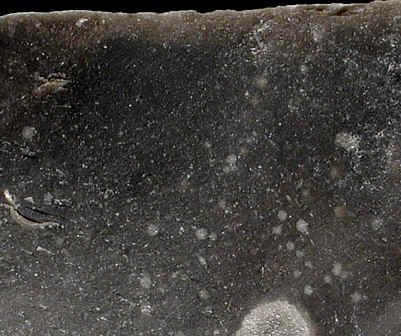 A sketch of the local geological situation can be found under http://www.engelen.demon.nl/ryckholt/geologie.html. In cooperation with our technical partner I/O-graph, we offer a transformation-service for the coordinates of the sampled sites. Just click here to send a mail. 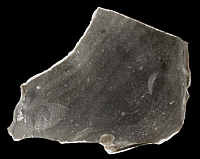 Flake of typical opaque "axe-flint"